The following is a book review from my wife Tracy. Every week in our house we have “Smoothie Tuesday”. Our kids in particular look forward to their weekly concoction of fruits and sometimes veggies. We have had several smoothie recipes in our rotation that we all enjoy, but I was very glad to come across this book and find many, many new ideas to try. 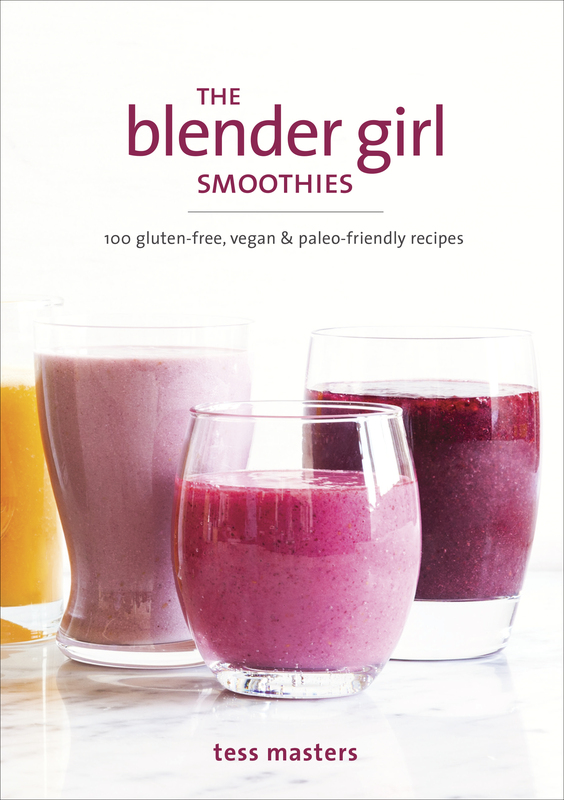 In The Blender Girl Smoothies, Tess Masters gives a wonderful introduction to smoothie-making that will please beginners as well as advanced blender-users. The book opens with some helpful introductory information including the proper order for adding ingredients to the blender, as well as a basic formula to help you create your own recipes. The end of the book includes recommended resources as well as information on various ingredients and the nutritional profiles of various fruits, veggies, and superfoods. One of the best features of the book is the full-color illustration of every smoothie. The recipes are divided into fruit-based recipes, green smoothies, and dessert options. We have tried several of the fruit recipes and everyone, including the kids, liked them. I am even motivated to try some of the green recipes! All of the recipes use easily-found ingredients and feature clear instructions. Each recipe also includes three optional “boosters”. These could be herbs, spices, extra veggies, or superfoods. Some of them are pricier items, but since they are optional, the smoothie will turn out just fine even if you don’t choose to use them. I highly recommend this book for anyone looking to expand their smoothie recipes. These blends taste great and they are practical to make. We will get lots of use out of this book. It seems that every era is guilty of forgetting the lessons of the previous one. We often think, a bit nostalgically perhaps, of the lessons we learned as we were growing up, and how the current generation has not learned those same lessons. There is an election in Canada happening shortly, and a potential candidate made a crude joke about the Nazi death camp, Auschwitz, and then apologized for making it saying she didn’t know it was a death camp. One may wonder how quickly we can forget such a thing, but even in the church, we are so forgetful about the lessons of the past. The arrival of the so-called, “People’s” Pope to the United States recently is one such event in which we have forgotten our past. It certainly should be expected that Roman Catholics would be excited about the arrival of their highest religious leader. It also shouldn’t be surprising to us that people who have no strong religious connection would welcome the Pope, since he has been advocating issues toward the Left that many would welcome, despite the cognitive dissonance this should demonstrate. What should be surprising is the amount of Protestant Christians who were whipped up into a Pope frenzy with his arrival, forgetting that, according to that Pope, and the Roman Catholic Church, as heirs of the Reformation, we still are condemned to damnation because of our theology (Council of Trent, Canons 9, 12, 14, 23, 24, 30, 33). While certainly there has been change within the Roman Catholic Church over the years, there is much that has not changed, and therefore should make us Protestant Christians wary of the Pope and the Roman Catholic Church. While there are so many issues on which we disagree, and are reflective of underlying fundamental differences (Popery, Mariolotry, the Mass etc. ), at the foundation, there are two differences that set us apart as Protestants. First, a history lesson. Why are we called Protestants? Because our historical forbears “protested” against the theological errors within the Roman Catholic Church. While it was not the design of the these people to leave the church and form their own denominations (they were “Reformers” of the Roman Catholic Church initially), ultimately, the fact that there could be no reconciliation over these issues should give us pause today in our relationship with Roman Catholicism. First, on what basis does our authority exist? In Roman Catholicism that basis is the authoritative interpretation of the Magisterium. “Wherefore, by divine and Catholic faith all those things are to be believed which are contained in the word of God as found in Scripture and tradition, and which are proposed by the Church as matters to be believed as divinely revealed, whether by her solemn judgment or in her ordinary and universal Magisterium.” (Vatican I, Dei Filius, 8). Further, “In matters of faith and morals the bishops speak in the name of Christ, and the faithful are to accept their teaching and adhere to it with a religious assent of soul. This religious submission of will and of mind must be shown in a special way to the authentic teaching authority of the Roman Pontiff, even when he is not speaking ex cathedra” (Dogmatic Constitution on the Church, ch. 3, n. 25). In contrast, as heirs of the Protestant Reformation we hold fast to the doctrine of sola scriptura, or that Scripture alone is our only basis of authority. In the Words of Martin Luther, “The true rule is this: God’s Word shall establish articles of faith, and no one else, not even an angel can do so.” Smalcald Articles II, 15. Many years later, John Wesley could remark, “In all cases, the Church is to be judged by the Scripture, not the Scripture by the Church.” (Popery Calmly Condemned, 1779). The Westminster Confession of Faith gives us further detail how this looks for Protestants, “All things in Scripture are not alike plain in themselves, nor alike clear unto all; yet those things which are necessary to be known, believed, and observed, for salvation, are so clearly propounded and opened in some place of Scripture or other, that not only the learned, but the unlearned, in a due use of the ordinary means, may attain unto a sufficient understanding of them.” Chapter 1, Section VII. Ultimately, this is rooted in our understanding of the nature of Scripture being God’s divine revelation to man and sufficient on it’s own (2 Timothy 3:16). We believe that we do not need some ruling body to tell us what we shall believe, but that each of us, can turn to God’s Word to interpret it and understand it for ourselves. In fact, the Bereans (Acts 17:11) are commended for being more noble because they searched the Scriptures to determine if what they were being taught was true. We as Protestants have the Bible in our hands in our language so we can understand it for itself. It is it’s own sole authority and not I, nor any other person, can bind your beliefs to one interpretation. Therefore, we cannot in good conscience agree with Roman Catholicism which puts the Word of God ultimately in the hands of only a few, and binds their hearers consciences to only church approved teaching. Next week, I will address our second point of departure, namely our fundamental differences on the issue of saving faith, justification, and imputed righteousness. Today, I mourn the death of my child. Unlike David, I still grieve. The pain is fresh and potent. It burns. Yet, like David, I too know that I will see my child again. Today at the breakfast table I told our children that Jesus loved our baby so much He wanted the baby to be with Him now in heaven. How heartbreaking were those words coming out of my mouth. I did not know if my baby would be a boy or a girl, but I am confident the Lord knew. I did not know my baby’s name, but I am confident that my baby has one from the Lord, written down in glory. I did not know what was in store for the life of my baby, but I am confident the Lord knew. I did not get to hold my baby, but the Lord did. I did not get to meet my baby, but one day across the Jordan, I will see my child. Without the hope in my sovereign and merciful God, and without the knowledge that my child has gone to be with the Savior, I would be in utter despair. I am hurt. I am angry. I cry and I wail, and like the voice crying out in Ramah, I weep for my child. Weep with me. And in the midst of this, I have a word for the church of Jesus Christ. Children are a rich blessing. Despite what the world tells us, children are a blessing from the Lord. They are expensive, and tiring, but I cannot imagine what life would be like without my 3 little ones the Lord has given me. I won’t know what it would have been like with 4, but it would have made my life all the richer. There is a stigma in our churches that miscarried babies are somehow less to be grieved over than babies already born. I’ve heard the callous and insensitive words uttered by Christians that “she’s young, please Lord give her another one” as if another child could replace the one that was previously growing in her womb. For all we talk about as pro-life people and “life in the womb” we are terribly insensitive and callous when people, who want the ones the Lord has given to them, lose them acting as if it was less of a baby somehow.My baby died. Just as if my 5 year old died. Just because I knew not the name of my child, or held that baby in my arms, does not mean I loved that gift any less. Grieve with me. Weep with me. Hope with me. But don’t act like that baby was any less a baby or that the baby could be so easily replaced. Keep your theological concern to yourself at this point. I know the Bible doesn’t explicitly say babies go to heaven, but I believe there is enough material to draw concepts from God’s Word together to form a reasonable inference that it be true. If you disagree, the best thing you can do is keep it to yourself instead of trying to theologically out-reason grieving parents. Losing your baby, at any age, at any stage of development is one of the most horrific experiences to go through as a parent. Yet, our culture has such a lackadaisical attitude to babies, and in particular, to killing said babies in the womb, when they are inconvenient. The church needs to be more dedicated, prayerful, and involved, with boots on the ground, in seeking to end the abhorrent abortion industry in North America. It’s not enough just to be angry, do something about it. As I grieve for my own lost baby, who was loved and cared for, I grieve, in some ways, even more for those who were not loved or cared for. Oh, how I wish I could hold each of them in my arms. If someone came to me today and said, “I’m going to abort this baby unless someone adopts it,” I’d be the first to reply, “I will love and care for your baby just as I would my own.” How much do you love and care for the babies of our nation? This is all so raw. But I didn’t want to wait until the rawness was gone. Then I’d edit out things and change the ways I worded them. I wanted you to come alongside me and weep with me and grieve with me in all the rawness of the loss of life. Then, I hope and pray you will be even more understanding, sensitive, caring for those who lose their babies in the womb, and dare I say it, even more willing to step up and help take care of the little ones who are not loved except by our Savior. Today marks the 14th anniversary of the terrorist attacks in the United States on September 11, 2001. I recall the event vividly in my own mind even today. I was in class at Detroit Baptist Theological Seminary that day. I was the only Canadian at the school that day. It was if what I heard and saw truly were not happening. I waited for almost 4 hours at the border trying to re-enter Canada. The after effects were immense as crossing the border for a few weeks after that was almost impossible. This was nothing compared with what so many went through that day and following. It was truly a world event that has affected us all even if we do not realize it. It will forever be remembered as my generation’s “where were you when?” What struck me the most after the event though was more theological than anything else. Many church leaders could not fathom that God could have had anything to do with that tragedy. That it must have been out of His control. Now, I know I am not saying anything here that is new. In fact, better men than I have eloquently explained how a sovereign God did control these events. But I want to focus on a few passages of Scripture just to remind us once again, that we serve a God that is sovereign and in control, of the good, and the bad. Daniel 4:34b-35 also reminds us of the sovereign control of God. “His dominion is an eternal dominion; his kingdom endures from generation to generation. All the peoples of the earth are regarded as nothing. He does as he pleases with the powers of heaven and the peoples of the earth. No one can hold back his hand or say to him ‘What have you done’” (NIV)? Nebuchadnezzar, the major world leader at the time, realized that God is sovereign and in control of all events. He does as He pleases. There are many other passages which demonstrate that God is sovereign. He is not weak like Open Theists would argue. Our God does in fact know the future. He knows the future because He has planned the future! That is designed to be a comforting thought, not a troubling thought. God is in control of all events in world history. Even 9/11. And yet, He is not a capricious God. He loves and cares for mankind and His creation. Isaiah 54:8 reads, “‘In a surge of anger I hid my face from you for a moment, but with everlasting kindness I will have compassion on you,” says the Lord your Redeemer.” (NIV). We should consider that all of us deserve death. None of us are less guilty than others (Luke 13:1-5), and so God is incredibly gracious to allow us to live, when we should die, just as others have always done. On this anniversary of a terrible event in human history, let us remind ourselves that if God was not in control of that situation, then we serve an impotent God. I do not want to serve an impotent God but an omnipotent God! I also do not want to serve a capricious God, but a loving and merciful God. What an amazing God we serve, the sovereign and merciful Lord of the universe! Blessed be the name of the Lord! You are currently browsing the Working out Salvation with Fear and Trembling blog archives for September, 2015.